– IN PIENO CENTRO A BOLOGNA ! ! ! Absolute Body Control is an electronic (minimal wave/synthpop) project started in 1980. It is notable as the first significant project of musicians Dirk Ivens and Eric Van Wonterghem. The project released a number of cassettes, but only one 7″ (Is There An Exit?) and no studio albums during its brief lifespan. Dirk and Eric later joined forces with Marc Verhaeghen in The Klinik, and they would later collaborate on a number of other projects, most notably Sonar. 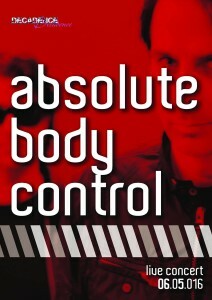 A compilation of Absolute Body Control tracks entitled ‘Eat This’ was eventually released in 1993. A more comprehensive 2CD compilation ‘Lost/Found’ was issued in 2005. A 5-LP box set of all their cassette releases followed in 2007. Dirk and Eric also took the project back on stage in 2006 and continue to tour with the project. In 2007, 22 years after splitting up, Absolute Body Control re-formed and will release Wind[Re]Wind, which contains newly recorded versions of their best tracks so far next to the brand new EP “Never seen”, containing a remix by The Horrorist. And a new album came out in 2010 Shattered Illusion & Sorrow. In 2011 came the album Mindless Intrusion & Surrender No Resistance with remix by the famous French Millimetric on Daft Records. 2013 saw the project remix tracks by post-punk/electro-wave band Section 25, namely “Microgroove” on the “Invicta Max” 10″ and “Beating Heart” on the 2013 remix CD “Eigengrau”. – NO CASUAL STREET WEARS, NO REGULAR CLUB WEARS, NO SPORT WEARS! – NO PHOTOS! NO CAMERAS! ONLY ALLOWED REPORTERS!